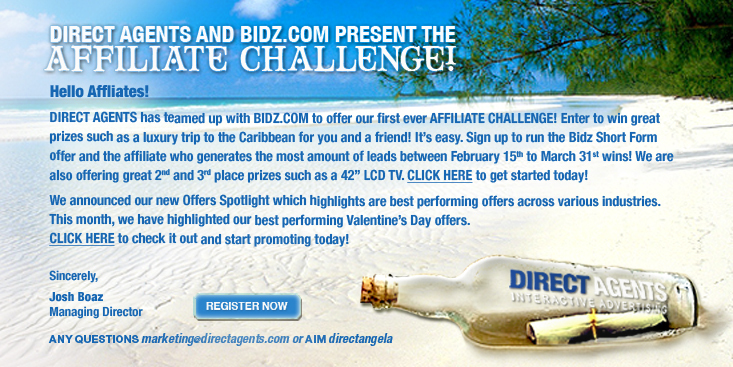 Direct Agents is currently holding an Affiliate Challenge. This is an absolute must for every serious Affiliate Marketer. All of your hard work promoting Bidz.com will certainly pay off. Trust me! When you are lounging in the Caribbean enjoying life with a close friend (or loved one) you will understand the rewards of this lucrative business. So what are you waiting for? Mark your calendars for Feb.15th,2009. Get Your Offer ready. If you are not with Direct Agents yet, make every effort to sign up as soon as possible. Get ready for some fabulous offers, high payouts, and wonderful affiliate managers! I hear this offer is converting well & highly recommend that your get as many leads as possible . If you utilize PPC ,Email, or banner ads you will be surprised at the ROI. Also Check out the second & third prizes offered. Wouldn't a brand new 42 ” inch LCD flat screen T.V. be nice? or a $300 gift card for whatever your heart desires? Wishing all of you good luck on the contest & your future endeavors. Sign up with Direct Agents Today! This has got to be the best time of the year to have a contest that involves going to a beautiful?and tropical paradise. Great Idea!